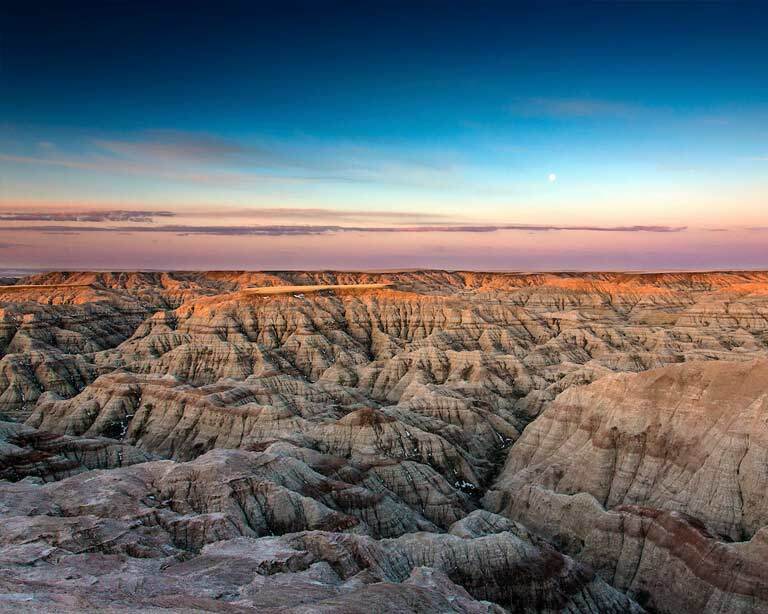 The first thing you might note when you visit the famous Badlands National Park of South Dakota is that perhaps they aren’t so bad after all. Wild Lands, Beautiful Lands, Good Lands all seem better titles to those who frequent this country. The name Badlands comes from the French-Canadian trappers who traveled the area 150 years ago and dubbed them “les mauvais terres pour traverse.” They can indeed be “bad lands to travel” because of the many bluffs, ravines, plateaus, and cliffs of this erosion-prone country. But what made them hard to travel also protected them from abuse. 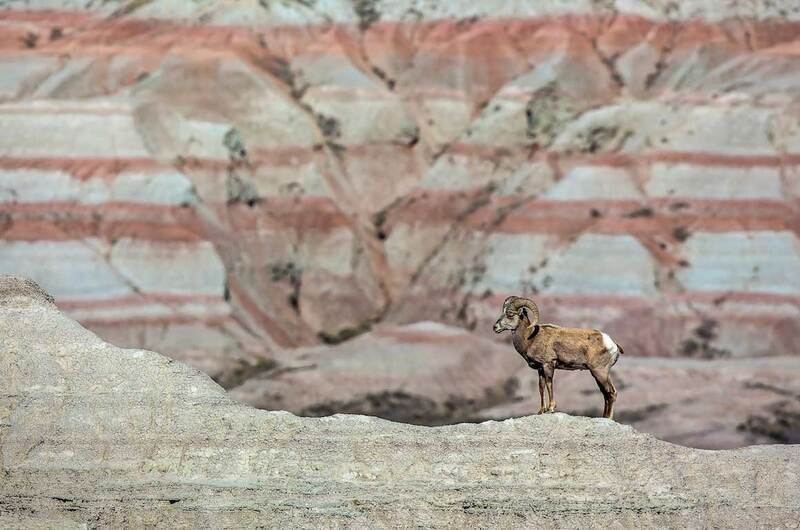 The Badlands are certainly arid, rocky, and perpetually dusty in the summer, but even the casual observer will immediately notice the signs of life all around them. There are hundreds of species of plants and animals, large and small, so well adapted to the environment that to them these lands aren’t the least bit bad. This is particularly true in the spring of the year, as the prairie thaws and life renews after a long Dakota winter. But, there is a secret to seeing the animals all around you. At times you may overhear impatient visitors grumbling about the seemingly barren, colorless landscape, but invariably those visitors will be standing at one of the many high vistas, looking down into the great chasms at high noon on a mid-summer day. With the sun high in the sky, the arid landscape will indeed seem dull and lifeless. Return to that same viewpoint at dawn and another world emerges. Striations in the sedimentary rocks shows bands of vivid color; animals hustle across the landscape filling their bellies before the sun rises high and rock becomes hot to the touch. Only the omnipresent prairie dogs, the keystone species of the entire ecosystem, and the many avian predators, seem impervious to the heat of the day. The rest of the animals; the bison, deer, bighorn sheep, badgers, coyotes, and pronghorns, all look for relief from the summer sun. Dusk brings them out again as the cool of the evening settles on the landscape. Some of those animals will even wait until darkness to begin their routine. Black-footed ferrets, one of the most endangered animals in the world, live here. They thrive in the night, pursuing prairie dogs deep in the myriad tunnels under the grassland steppe. There is a bustle of activity on the darkened prairie while a billion stars revolve overhead to remind you where you fit in this world. Life and death dramas occur day and night in the Badlands. For the first-time visitor you must learn to be watchful – to rise early and stay late. Take a cue from the animals and doze during the day in whatever shade you can find. And bring good binoculars or a spotting scope and a solid tripod. 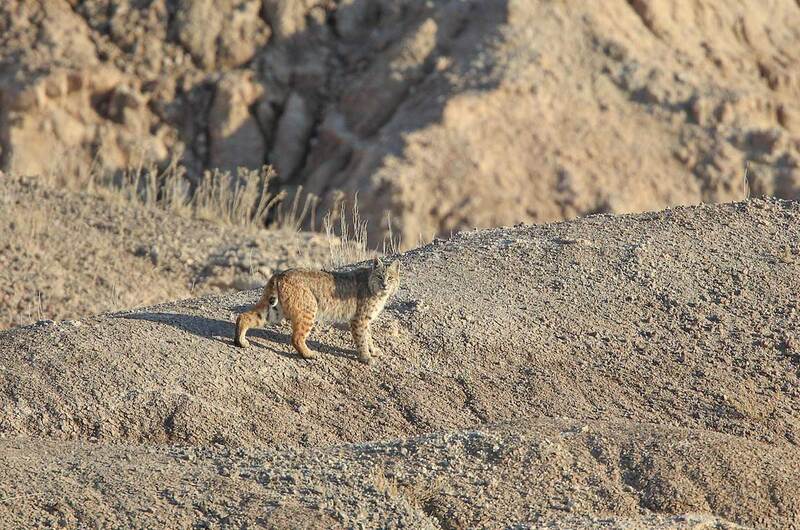 The views are long, the animals abundant, and the life is everywhere if you know where and when to look. They are Wild Lands, Lovely Lands, Good lands.